Man's Search for Meaning describes Viktor Frankl's reflections and psychoanalytic conclusions drawn from his time spent in a Nazi concentration camp. Being an Austrian Jew during the rise of the Nazis, Frankl and his family were all taken to concentration camps in 1942. He lost his wife and his parents to the camps. He even lost the only copy of his manuscript for his new book. Despite the harsh conditions he endured in an environment where it was estimated at the time only 20% of prisoners would survive, he derived a purpose for his existence he believed kept him and others going. This helped him further his research into his system of psychoanalysis known as logotherapy. The very slim book – numbering 221 pages in most editions – is divided up into two sections. The first discusses his experiences and observations in the death camps and the second is a discussion on psychoanalysis called "Logotherapy in a Nutshell". Man's Search for Meaning has become a best-selling book and is promoted by a lot of motivational speakers. I was moved to buy it upon reading the works of business management expert Dr Stephen R. Covey. He argues that Frankl and his approach to psychology promotes the proactive method. The truth is Man's Search for Meaning humbles most of its readers. As irrational as it may seem the fact that someone can lose everything – his comfort, his freedom, his loved ones, his work and his dignity – during one of the most famous atrocities in 20th century history and still come out positive belittles most other personal problems. Despite this logical fallacy, Frankl does set up a brilliant example of the philosophy of a survivor. He is also a very astute and shrewd observer as you would imagine being the founder of the third great Austrian school of psychoanalysis. Today, psychoanalysis is respected for the attention it has brought to the study of human behaviour and the mind, but many scientific sceptics regard it as a pseudoscience. However, this takes nothing away from the human behaviour observations that Frankl noted. Much of it is in line with mainstream behavioural science. Personally I see his school of psychoanalysis to be closer to a motivational philosophy than a "soft" science. 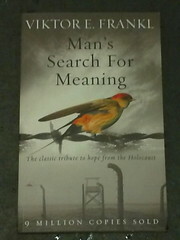 Man's Search for Meaning is a very inspirational book and a great source for inspiration. Humans seem to desire a purpose. If they feel they are serving a purpose and a worthy one they seem to be able to endure a tremendous amount of hardship. This seems to be the main crux of Frankl's argument. He watched those in the camp who gave up hope and those who refused. Where Stephen Covey derived the proactive message in the story comes from the various mental exercises that Frankl used to keep his mind striving for purpose. This included holding imaginary lectures on his thoughts and ideas. Aside from the motivational side of the work, the observations of warders and inmates are also fascinating insights. For example, Frankl observed how some warders would exercise sympathy and compassion; even break the rules to help prisoners to such an extent that when the camps were liberated prisoners actually harboured them from the occupying allied forces. More interesting was the way that prisoners, destined to die, would become sadistic and even more savage than actual warders when given positions of authority over their fellow inmates. Man's Search for Meaning remains an essential read for positive and proactive thinking. It is surprisingly very short and easy to digest. The horrors of the camp are explained in graphic detail, but discussed to support the concepts of Frankl's philosophy. It is an important work that transcends its position as a psychological non-fiction title. I would recommend to anyone who feels they have lost their direction. If you enjoyed this review, please buy your copy of the book (hard copy, audio CD or Kindle) through one of the three links. You won't get charged a penny more than normal, but Amazon will pay this site commission. Thank you!